The island Serifos - Seriphos - Σέριφος, north-west of Sifnos, is a bare and rocky island, its hills slashed by gorges; its highest point is Mount Tourlos with 483 m.
The island's main sources of income are its modest agriculture and its open-cast iron mines, which have been worked since ancient times. The ore used to be shipped from Koutalas on the south coast, where there is now room to anchor (magnetic anomalies are reported due to the remaining ore!). In the season especially Livadi is much frequented by charter yachts; the Chora, towering above the sheltered harbour of Livadi, makes this one of the most stunning approaches in the Northern Cyclades. Most of the anchorages in the south are now used by filthy fish farms. Moreover, apart from Livadi and the Monastery of the Taxiarchs in the north, there is not much to be seen. 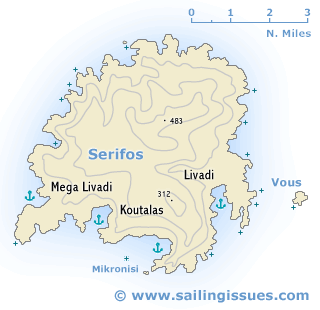 Yet, Serifos' main port provides a safe stopover on route to the beautiful island of Sifnos. The newly constructed marina is safe and secluded. Originally settled by Ionian Greeks, the island shared the fortunes of the other Cyclades. In Greek mythology it was the island where Danaë and the young Perseus were washed ashore.